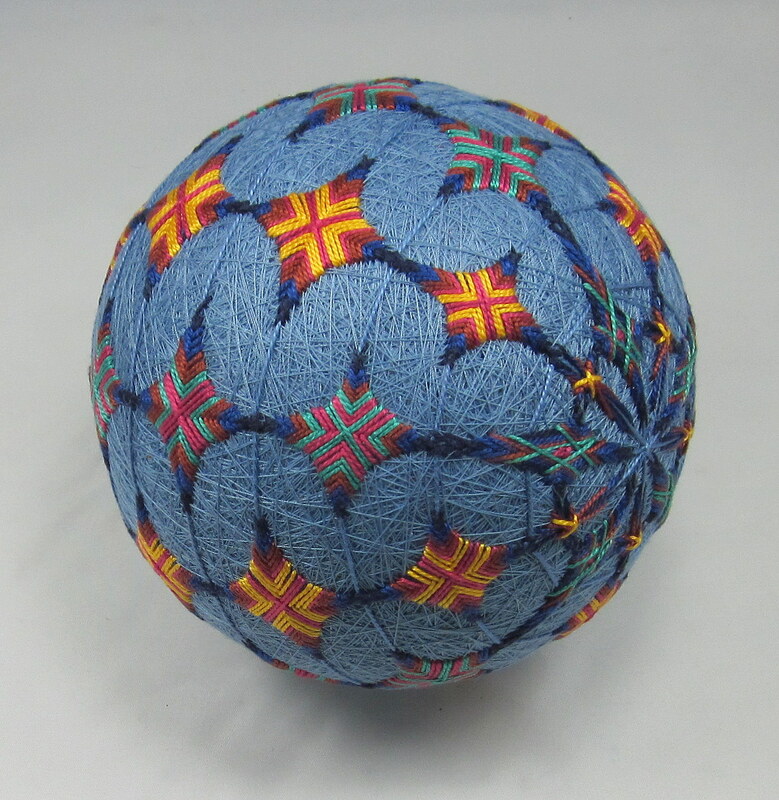 The parasols pattern in this Temari are shown in a Diana Vandervoort book. 4.68” diameter. I’ve looked at and passed by this design many times the past few years. All of a sudden it took center stage after a new bright red ‘mari’ was sitting on my work table, ready for something. Each one of 12 centers has a different combination. That element alone was exciting, seeing how the same 7 colors changed as each one progressed. The black dots at the centers and at each spoke really made the pattern. The dominant yellow rings also described each one well. The simple repetition of one stitch repeated from center to perimeter with the spoke arms developing along the way really is lovely. Simple Division, many centers. 6” diameter “Pillows”, linked up, chained together. Such a simple little form. 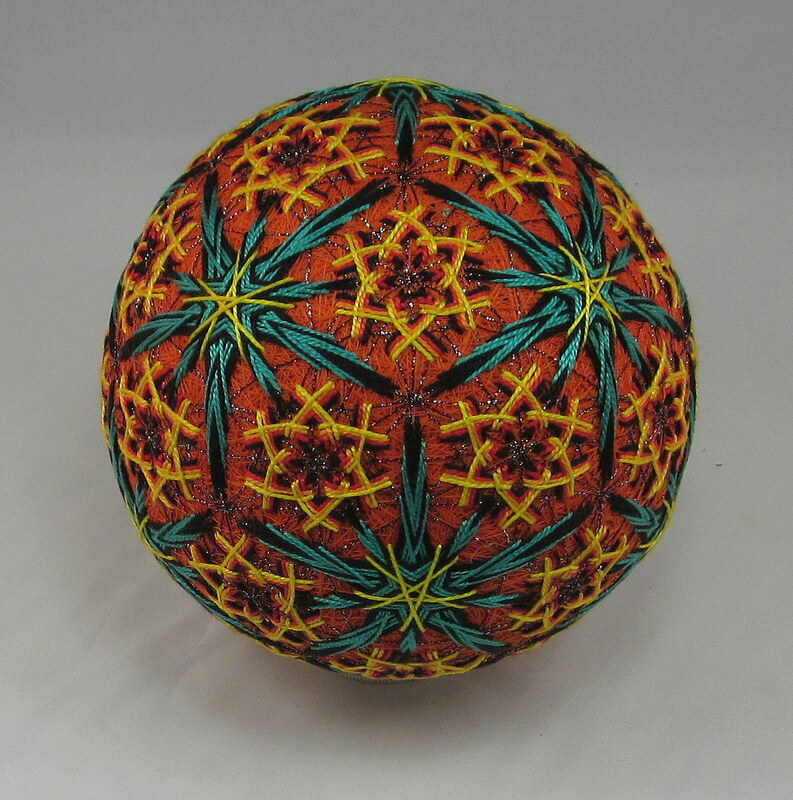 Looking through Diana Vandervoort’s Temari Gifts book I found the pillows form. Multiplied and chained together they become a lovely pattern and design. And, oh yes, there are many ‘irregularities’ in each ones shape. Those irregularities are part and parcel of hand work, at least for me. 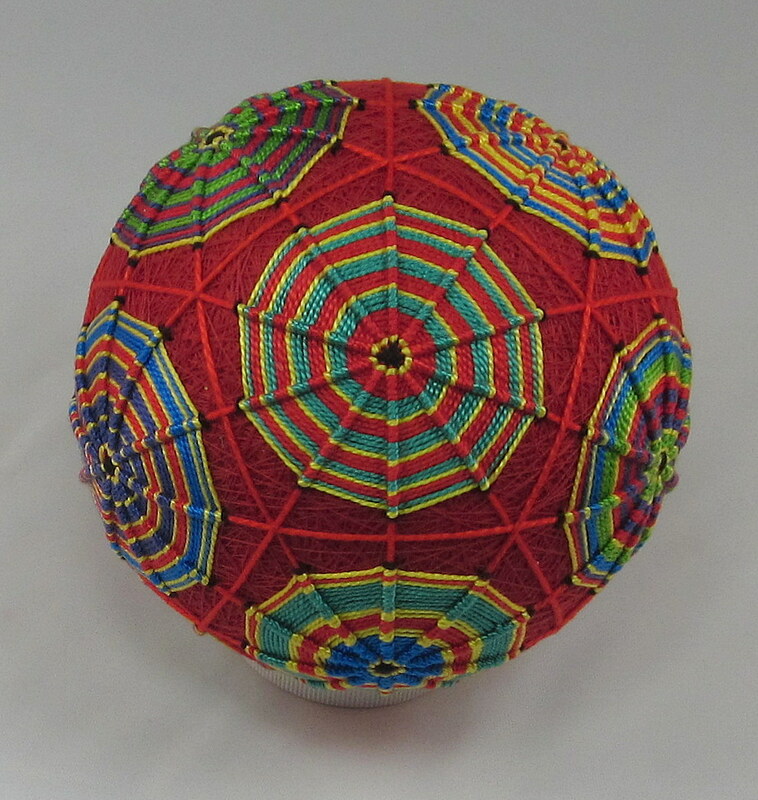 I love the N-S poles star that joins them together in a complete net. My western mindset argues that each center must be a perfect match to every other, while my wholeness mindset posets that it’s the cracks showing up that are where the light shines through. This age old dilemma repeatedly shows up in my life’s experience. How about yours? 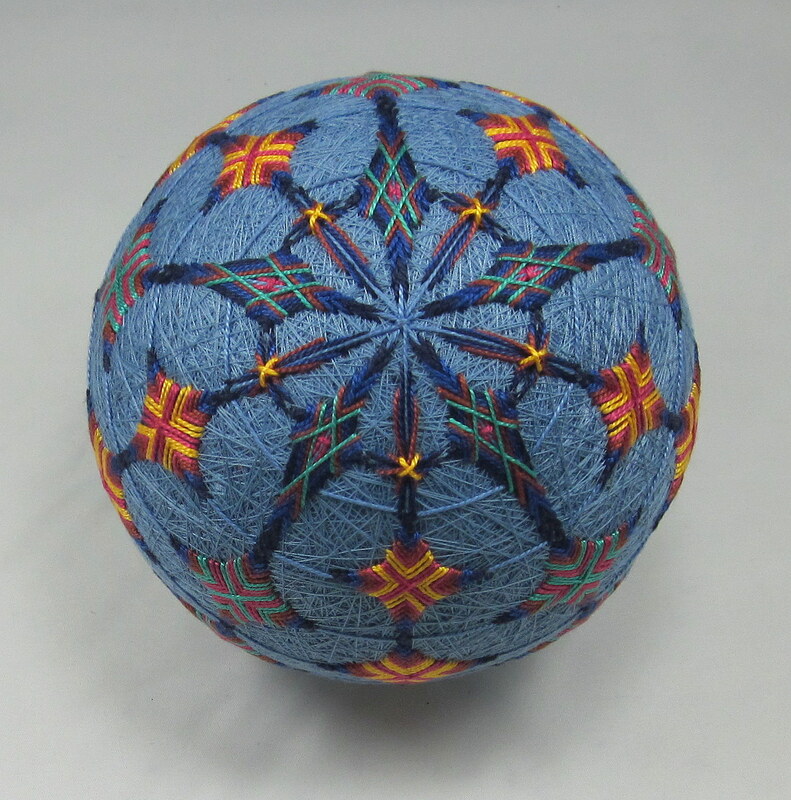 A new learning piece from master teacher, Temari artist, Barb Suess. 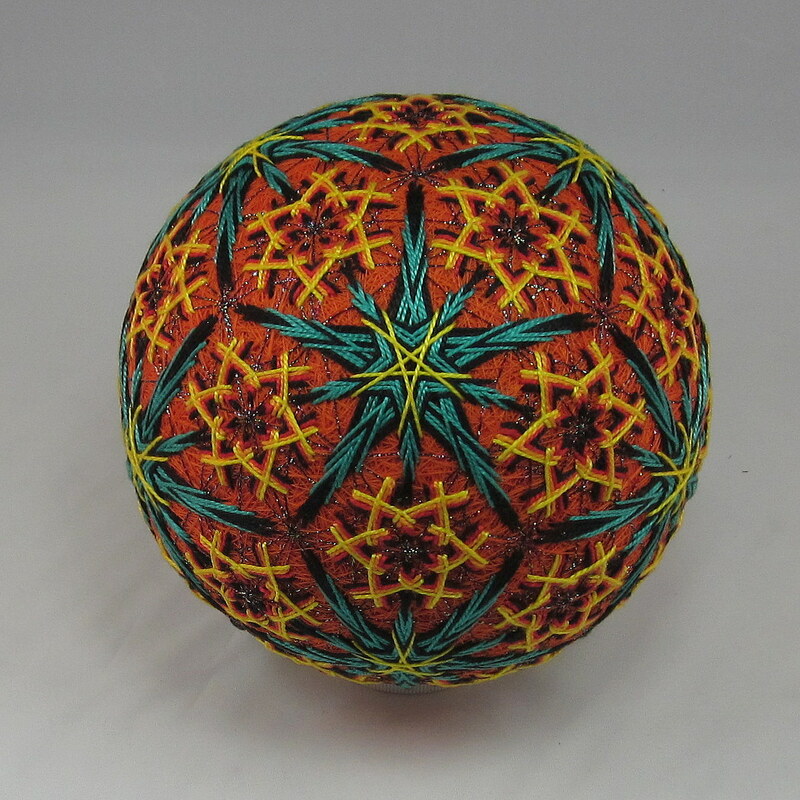 Challenging at every level, from size and complexity of structures on the surface to choosing to work in a different colorway than the original instruction. All the learning questions and basic insecurities of trying something for the first time were present from start to finish. It’s overall appearance has a whole other pattern emphasis than the original. One of the great things about stepping up to a new challenge in skills is not knowing where will it take me next. 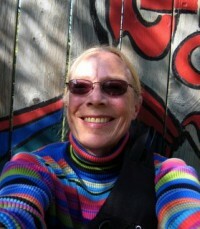 How will overcoming the doubts that were a constant companion throughout the process show up from here on out? What other forms and patterns will show themselves when using 42 design centers next? What will the added confidence and experience of completing this one do to influence new work? I guess that’s all part of the fun, now that it’s complete. In the middle of the work, the flow of the fun part was kind of lost to just keeping my mind above the inner critical voice chatter. Even though ‘seeing’ the areas which need more experience, practice and attention I love the results. Now that it sits next to me on my work table, finished, I can attend to it in a different way. As time passes, allowing new eyes to look at it and evaluate rather than criticise will bring all aspects of the learning home.